The ice menorah outside Deering Library. 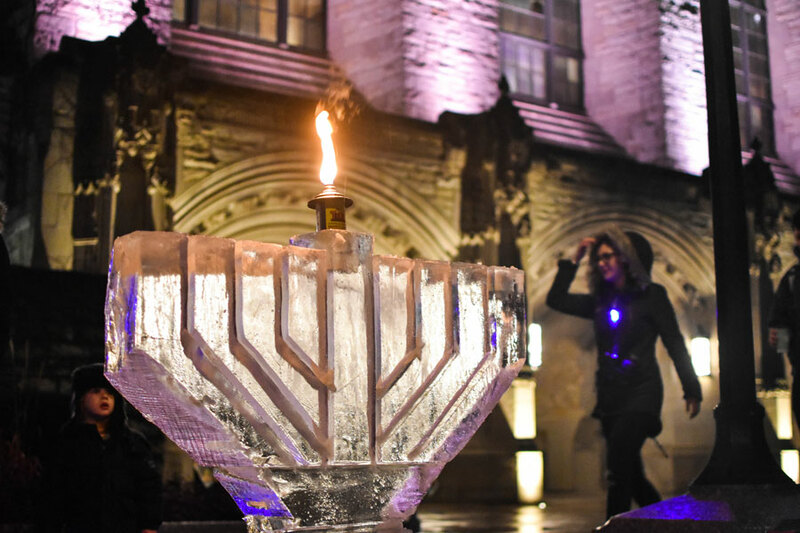 Students and Evanston community members came together Sunday evening in the rain to carve and light an ice menorah and celebrate the first night of Hanukkah in front of Deering Library. The event was organized by Northwestern Hillel and Northwestern Chabad. After a menorah was carved out of an ice block, students from Hillel and Chabad lit the two candles and said prayers. Becca Haas, the program associate for Hillel, helped organize the event. It is special to be able to do it when students are on campus, she said, because Hanukkah typically falls over winter break. Hanukkah, which lasts from Dec. 2 to Dec. 10 this year, is the celebration of the miracle of one days’ worth of oil lasting eight days, allowing a menorah to burn in a newly rededicated Jewish temple. Two of the nine candles on the menorah are lit on the first night of the holiday (the “helper” candle and one other), and the remaining are lit one at a time on nights two through eight. While the event was student-centric, Weg said, a healthy mix of both students and people from the community were in attendance. He attributes this to the unity that arose after the Jewish community came together to hold a vigil for the eleven people killed in a shooting at the Tree of Life Synagogue in Pittsburgh. Chabad president and Weinberg senior Robbie Belson agreed that solidarity in the community is something he wants to see more, and that this menorah lighting is part of a continued effort to have the local Jewish community come together. One of the themes of the holiday is to “share the light,” he said, and that community and inclusion aren’t just a Jewish values but Northwestern values as well.